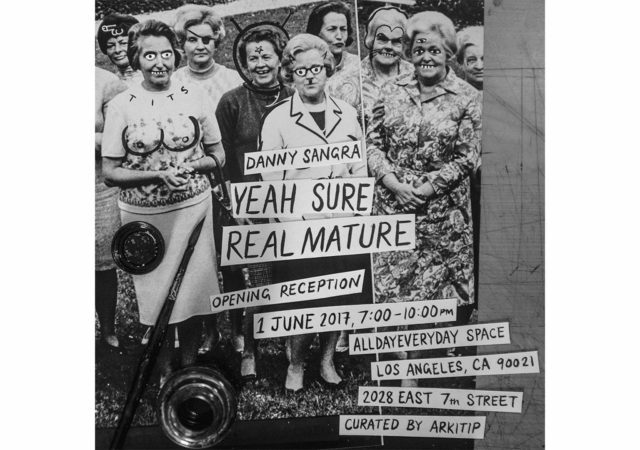 Danny Sangra has a new solo exhibition called ‘Yeah Sure, Real Mature’ opening in Los Angeles this June. Danny, of course, works across any number of media including film, illustration writing and photography. This exhibition focuses on his use of appropriated and repurposed content, specifically drawing over old magazine images. “I’ve been drawing on magazines longer than I’ve been drawing on blank sheets of paper. Growing up in my parents’ hair salons, I was often bored. To fight my boredom I would draw on the hair and beauty magazines. This pretty much got me into trouble every weekend. Customers would flick through the pages to find my biro-drawn eye-patch over a model’s face or discover my warped version of Sonic the Hedgehog, scrawled over a cigarette ad. This collection of work is from a four year period. Now with my travelling for film work, I always try to find vintage magazines that offer new images for me to manipulate and re-contextualise.